Different breeds of dogs have different skin sensitivities and fur types so you should keep that in mind when choosing a dog shampoo. If your dog has a thin coat you would use a different shampoo that someone with a thick coated dog. So you may be wondering, how do I choose a dog shampoo? Does your dog have any skin issues? Do they need a hypoallergenic dog shampoo, a moisturizing shampoo, or a medicated shampoo for fleas and ticks? 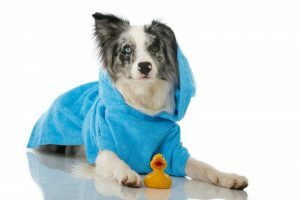 While dogs don’t need to take a bath as often as we do, giving your dog a bath periodically is important for their health and hygiene. You want to ensure that you are using the best dog shampoo to remove odor from your dog. We like to use and recommend natural products when possible and try to find products that contain oatmeal, natural extracts, and are vegan and/or organic. Bonus: this doesn’t mean they are more expensive! Many of the shampoos made to combat odor consist of better ingredients that soothe your dogs skin and condition its coat. You can even buy a dry dog shampoo that fights odor! No more messy time consuming baths! If you are looking for an all-natural, paraben free and a product that does not cause irritation or inflammation to your canine buddy’s eyes/nose, do opt for the OxGord Natural Oatmeal Dog-Shampoo and Conditioner. And if your choice is to removes odor and dirt off your dog’s coat without the messy activity of a bath then do opt for the Paw Choice Dry Dog Waterless No Rinse Foam Mousse shampoo. 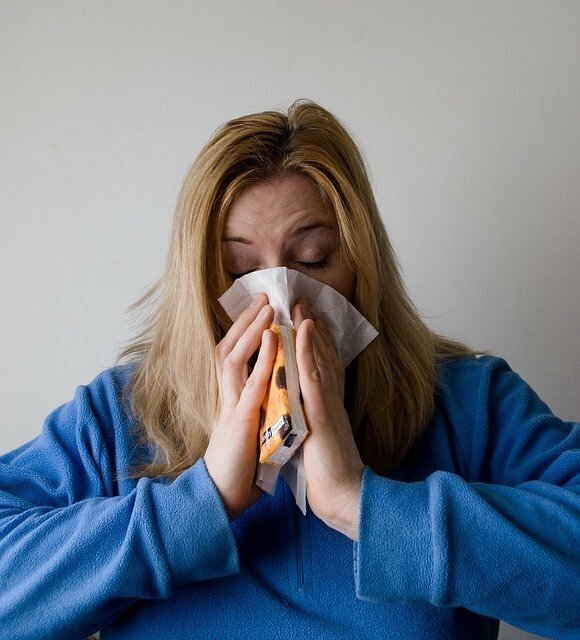 Fleas feed off of your dogs blood and the bites leave them irritated, itchy and your dog may even be allergic to them. 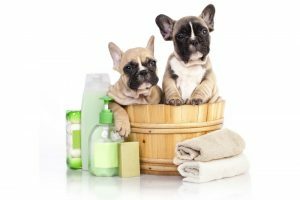 It’s a great idea to research the best dog shampoos for fleas before deciding which one to use on your puppy or dog. Read the ingredients and reviews to learn if the product is gentle on your dog and any side effects it may have. When in doubt, check with your vet. 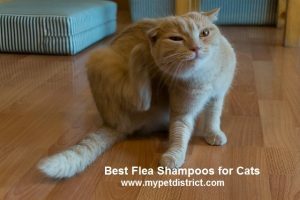 The video below will show you how to check your pet for fleas so that you can be sure before treating them unnecessarily. An effective anti-flea medicated product kills the adult fleas and hopefully their eggs as well, ending the flea’s life cycle, thereby alleviating your dog from discomfort. Does dog shampoo expire? YES! Please be mindful when purchasing that you use all of the product before the expiry date for it to be most effective and not harmful to your pet. When in doubt, throw it out! Anti-flea shampoo can be used like a regular product and it doesn’t cause any harm to the dog’s coat and skin. 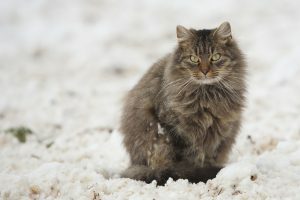 The same can be used with a spot on treatment product or with a flea collar for more effective treatment. Don’t forget a flea comb is part of your weapons against infestation: you can comb out the eggs, flea dirt, and adult fleas to provide immediate relief. Does your dog have a thick coat? If you can’t easily see their skin through their coat or can see that there is another, undercoat layer, underneath the top layer of hair then your dog has a thick coat. These sorts of dogs, such as the Pomeranian or German Shepard, require frequent grooming. 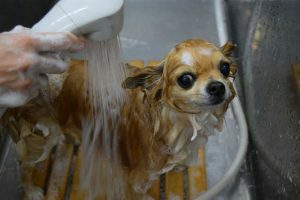 Their undercoat keeps them warm in the cold weather, cool in hot weather and keeps their skin completely dry so its hard to get their skin fully wet when giving them a bath. You would need to purchase a shampoo such as Foam Care by Vetericyn that is specifically designed to work with thick coats. Also learn techniques to help penetrate the undercoat and give your dog a full bath. If you can see your dogs skin easily through its coat, then your dog has a thin coat. Examples are a doberman or a pug. This requires different shampoo than a thick coated dog. Your thin coated dogs skin is more exposed to the elements such as wind, water, sun cold and heat and requires a specially formulated shampoo to condition the skin. A hypoallergenic oatmeal based shampoo should do the trick, such as Pro Pet Works. Like humans, dogs need regular bathing and grooming because these are important parts of general pet care. Aside from giving them the right food, using the best dog shampoo that works for their skin is essential to keeping them healthy. Is your dog always scratching? Do you find that there are some white patches and flakes that appear in your dogs coat when it scratches? If your pet is suffering from ringworm, pyoderma, fleas, allergies and other skin problems, your dog may require a medicated shampoo. Your dog or cat will get quick and long lasting relief from skin issues from using a medicated shampoo. Remember to follow the directions on the bottle for maximum results. Please work with your vet if your pets skin problems do not go away after using a medicated shampoo. Maintaining your dogs natural pH balance on their skin is key to avoiding a problem with dry skin. A moisturizing pet shampoo such as this Natural Pet Shampoo can control and soothe irritable skin. Bonus: you can use it on your cat too! Try to choose a shampoo that contains mostly natural ingredients that are known to promote and lock in moisture such as aloe, coconut and argon oil. Sometimes the best way to pick a dog shampoo that is good for your dog is to read reviews and listen to other customers. We posted a round up of the top 10 dog shampoo brands here. 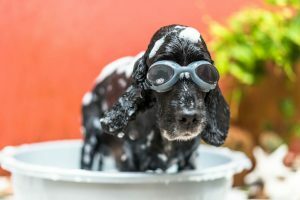 This post covers everything from medicated dog shampoos, to dog shampoos for fleas, to natural and organic dog shampoos. Remember frequent bathing can strip away the natural oils from your dog’s skin leading to dry and itchy skin. The grooming products available on the market, no matter how mild they are, can disturb the pH balance of the skin of the dog.The brands are evaluated based on their compatibility with different skins and coats, pH balancing of the skin by preserving the natural oils, and anti-allergen properties. You may be asking yourself…dogs get lice? Yes! 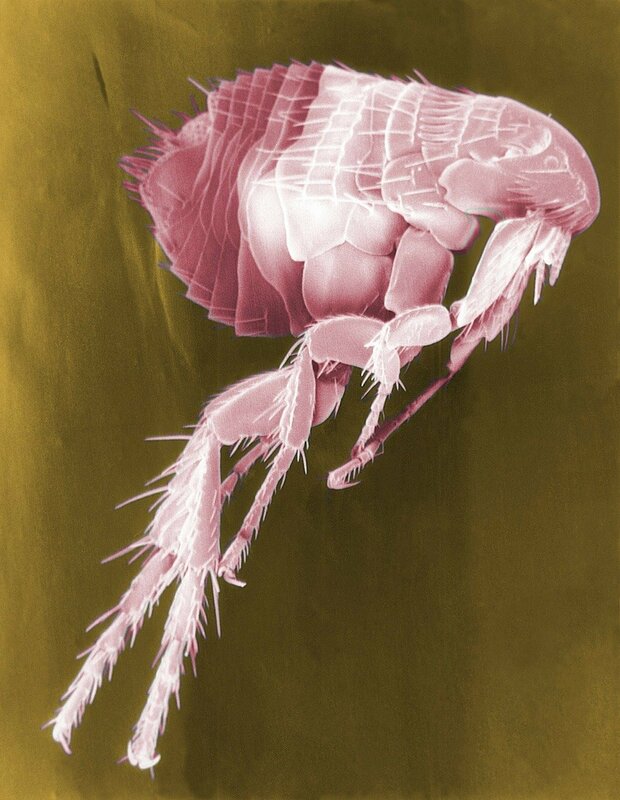 Lice are species specific meaning there are some that live on humans and some that live on dogs. What are the symptoms that indicate your dog may have lice? What can be done to treat it? Does dog shampoo kill lice? Once you have determined that your dog has lice, the first line of attack would be to kill the lice with a dog lice shampoo. Some dog shampoos can kill lice and prevent them from coming back. Read the bottle of shampoo carefully, some will state it right on the bottle and also list active ingredients like lime sulfur, pyrethroid, and pyrethrin. Make sure that the shampoo you purchase is effective at treating lice and still gentle on your dog. 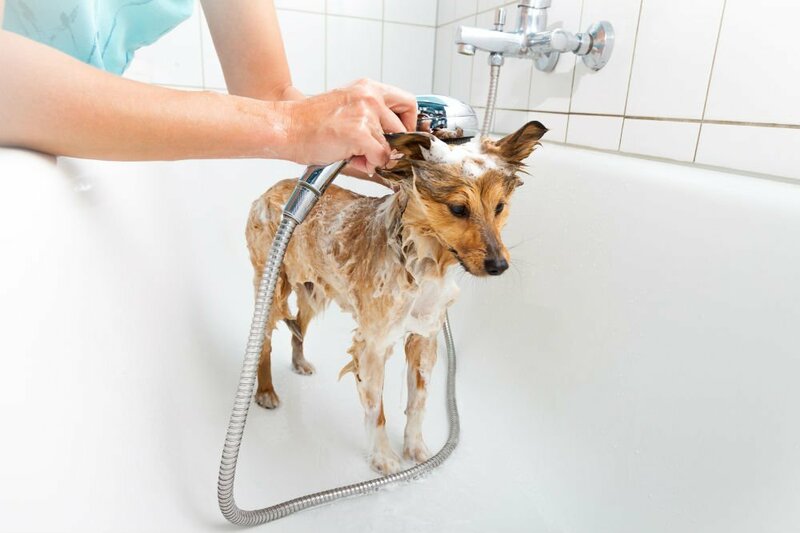 Examples of good dog shampoos are Nootie Medicated Dog Shampoo, 4-Legger Certified Organic Dog Shampoo, DakPets Dog Shampoo and Conditioner, and Nootie Oatmeal Dog Shampoo with Soothing Aloe. 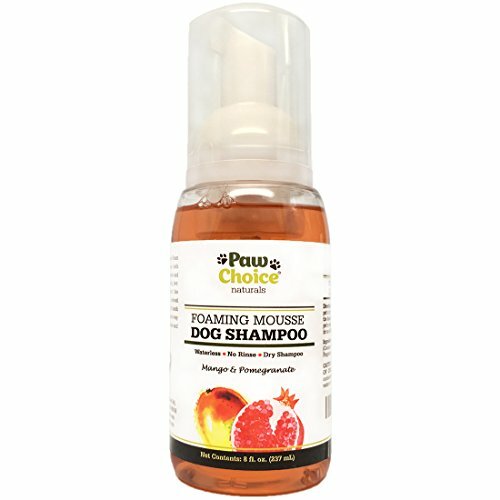 Read the labels and our reviews to know more about the effectiveness of each dog shampoo. Hypoallergenic Dog Shampoos are formulated without many common ingredients that cause allergic reactions in sensitive dogs. If your furry friend has allergies and sensitivities to food, grass or flea bites, then a hypoallergenic dog shampoo should do the trick. A lot of veterinarians recommend hypoallergenic dog shampoos because they are made of all-natural ingredients that effectively soothe dry, sensitive, and itchy skin. There are no alcohol, sulphates, added colors, and harsh chemicals that can cause irritation and other skin problems. One such shampoo is Pro Pet Works Natural Oatmeal Shampoo for dogs AND cats. Please read the full review here. Instead, hypoallergenic dog shampoo and conditioner consist of organic ingredients such as aloe, oatmeal, coconut oil and essential oils. Aside from this, some shampoos also contain vitamins E, D, and A to nourish the skin and coat and to ensure it is easy to brush your dogs coat afterwards. Do you have a light colored dog such a a Bichon Frise? Some light colored dogs will get dirt stains on their faces, legs and feet from just being dogs. 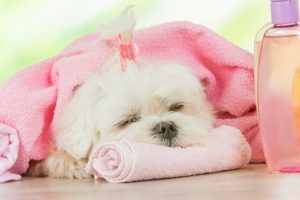 In order to remove those stains, you need to purchase a shampoo that is specifically formulated to whiten and brighten your dogs fur without drying it out. These products remove yellowish color of your dogs coat and restore its shine. Ensure to purchase a whitening shampoo such as Chris Christensen White on White Shampoo for Pets which doesn’t contain any harsh chemicals that can harm your pets skin and coat. Most of these products will need to be left on your dog for about 10 minutes to achieve maximum results. Please read the full review here. Please let us know in the comments below which dog shampoo you use and why!